Download the manual "ADAM-4000_manual_V20.pdf" from the above link. ADAM has 8 Outputs and 7 Inputs. 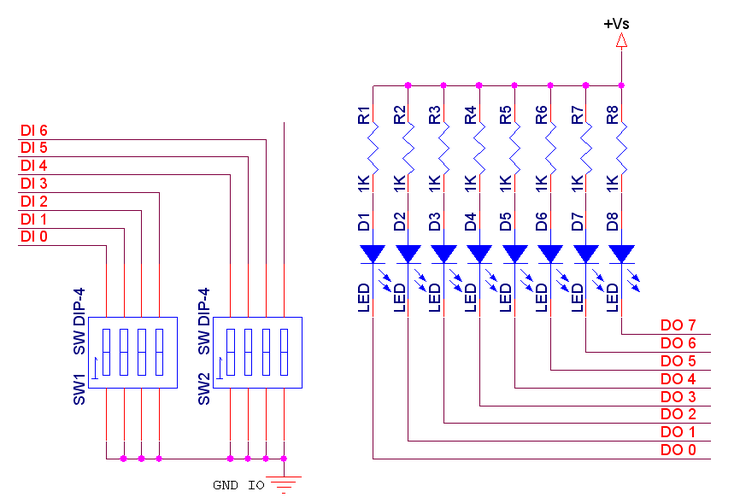 I have attached 8 LED and 7 DIP Switches ( BEST for testing ). For ADAM-4050 command set refer to manual pg.130. Is this protocol only using visible ASCII ( 0x20 - 0x7f )? or is Binary also being used? Except for the line termination Cr ( 0x0d ), only Visible ASCII are used. If "00", it writes to all 8 channels at the same time. ( data ) ranges from "00" to "FF"
lsb is DO 0, and msb is DO 7. If "10" - "17", it writes to each channel. In this case ( data ) is either "00" or "01". It says as response we receive ">( cr )"; however we are not going to care about this for now. ( dataOutput ) Loop back from output. 2 character string. If we get "A0", it means that DO 7 and DO 5 is ON and rest are OFF. 2 character string. This value is what we want. We don't know what this is for, so let's not worry about this.